The cannabinoid receptors CB1 and CB2 are key components of the human endocannabinoid system, a biological network involved in regulating physiological and cognitive processes. NIDA-funded scientists have recently identified the crystal structure of the CB1 receptor and have some understanding of how it modulates the system. CB1, which is widely distributed throughout the central nervous system, can be activated by some naturally occurring cannabinoids, or through the use of cannabis and related synthetic compounds, resulting in the “high” associated with marijuana. Several years ago, CB1 was used in medications to suppress appetite, but this approach had limited success and was pulled from the marketplace because of difficult side effects. In contrast, CB2 is mainly expressed in the immune system (to a lesser extent in the central nervous system) and does not create a psychotropic reaction. As a result, CB2 is emerging as a potential therapeutic target for treating inflammatory and neuropathic pain. However, it shares many of the same genetic traits as CB1, so it has been challenging for scientists to delineate how each one works individually to create their effects, making it difficult to create medicines that can activate CB2 effectively. Another NIDA-funded paper just published in Cell by the same group reveals how small molecules affect CB2 differently than CB1. Investigators not only identified the crystal structure of the CB2 receptor, they also found some distinct characteristics between CB1 and CB2 in the miniscule spaces where chemicals bind to each other. In addition, the study revealed a molecular mechanism critical for CB2 activation. 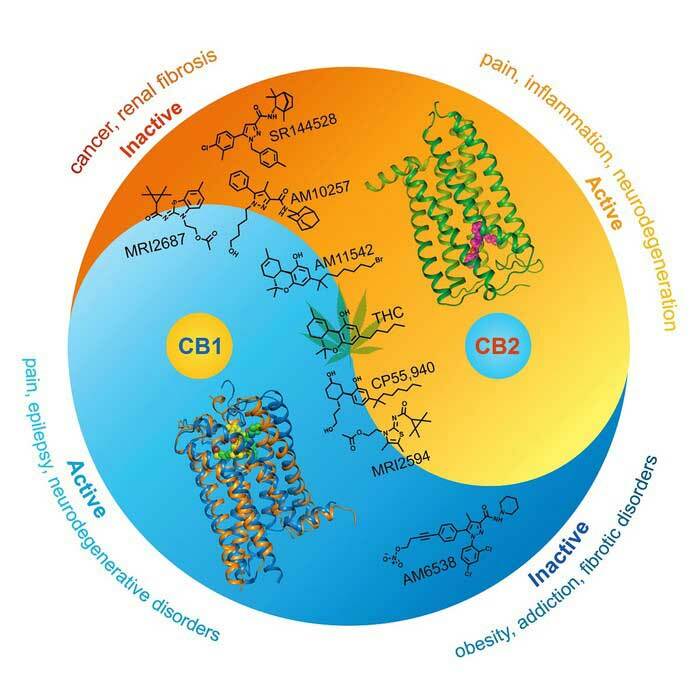 These findings introduce new principles that will enable more selective drug design, bring new hope for the therapeutic potential of CB2, and represent an important finding in our understanding of the endocannabinoid system. For a copy of the paper, published in Cell, go to Crystal Structure of the Human Cannabinoid Receptor CB2. For more information about marijuana and cannabinoids, go to: Drug Facts: Marijuana as Medicine. NIDA. "A whole new view of CB2." National Institute on Drug Abuse, 25 Jan. 2019, https://www.drugabuse.gov/news-events/news-releases/2019/01/whole-new-view-cb2. NIDA. A whole new view of CB2. National Institute on Drug Abuse website. https://www.drugabuse.gov/news-events/news-releases/2019/01/whole-new-view-cb2. January 25, 2019.